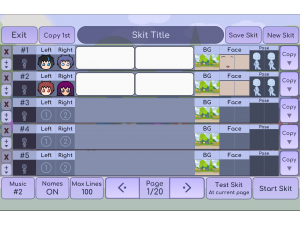 Skit Maker is a feature in Gacha Life that enables you to make up your own scenarios involving the different characters you create in the game. Although the Skits you make can have up to 100 scenes you can only have up to two characters on the screen each time. When you make a Skit the first thing you need to do is choose what position your characters are going to be on the screen. This will be a character on the left and one on the right. Speech bubbles can then be added to each of them in the white boxes in the middle. The options to change the background of your Skit are on the right side of the screen along with the character facial expressions, and poses.